Amount of time devoted to this DS game in the last week--Three hours, 39 minutes. Most recent boss toppled, location reached or milestone achieved--I've played through (and earned golden crowns for) the easiest versions of all of the songs that are available to me at the moment. I've also played a handful of the daily challenges. Overall comments on the experience--Before I tucked the colorful Taiko no Tatsujin DS cart into my 3DS last weekend, I imagined it would be a nightmare--or at least a bore--to play using buttons rather than a pair of styli. I mention that because despite those misgivings, I began my first Taiko DS foray by--you guessed it--using the former instead of the latter. I'm glad I did, because it forced me to recognize that this style of play actually is pretty fun. It can be a little awkward, yes--especially when you have to press the left and right shoulder buttons on your DS or 3DS system at the same time to hit a blue "Big Note"--but it's nowhere near as unplayable or even uncomfortable as I thought it would be. As for playing the game using the two Taiko-branded styli that came packed inside its case, that's nice, too, of course, although it can be a bit trying to transition from one control method to the other. (I've been switching between the two because I don't want to scuff up the screens of my 3DS.) Also, using the styli-plus-touch-screen combo can feel less accurate than buttons now and then--particularly when tackling the blue "Big Notes" mentioned above. 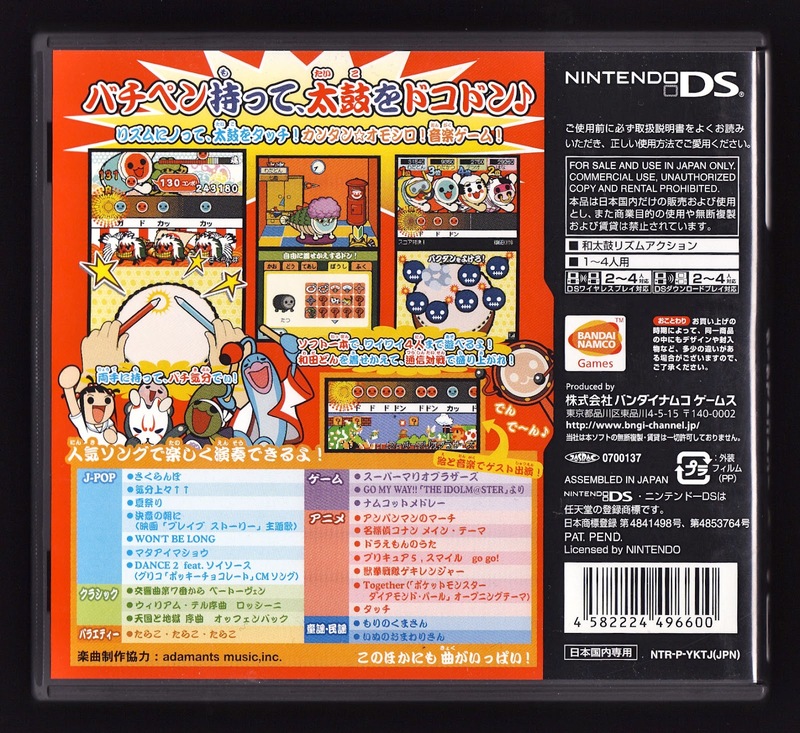 With that out of the way, the other obvious aspects to focus on while critiquing Taiko no Tatsujin DS are its soundtrack and its aesthetics. The former's more important to the overall enjoyment of this game, I think, so let's start with it. Although just 35 songs are on offer here (I've only got access to 30 of them at the moment), that's proven to be more than enough for me thanks to the variety of the selection. Among the genres represented in this particular title: anime, classical, folk, J-POP and "game music." I can't say I knew any of the included anime or J-POP tunes before I began this Taiko journey, but that didn't keep me from enjoying every single one of them after a couple of plays. As for the aesthetics, well, that's the element of the Taiko series that first grabbed my attention way back when, so it should go without saying that I find it awfully appealing. Of course, it's bright, colorful, cute and very Japanese--what's not to like? 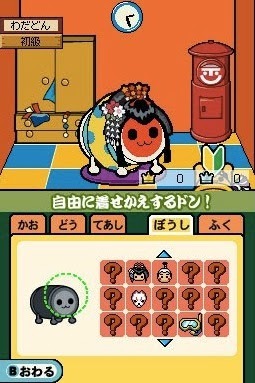 That its protagonist, Don-chan (an anthropomorphic taiko drum), is beyond adorable--not to mention one of my favorite game mascots--helps matters a good deal, too. In the end, the nearly four hours I've put into Taiko no Tatsujin DS so far has me pining to play other iterations--especially one or more that use the famed "Tatacon" controllers--as soon as humanly possible. Will I continue to play this game in the coming days, weeks and maybe even months?--Definitely, although it's likely to be set aside sooner rather than later so I can play the first Taiko no Tatsujin title that was released for 3DS a few years ago, which I recently picked up. Do I recommend it to others?--If you tend to enjoy playing rhythm games and you also like--or at least don't actively dislike--Japanese music, yes, I'd very much recommend buying this game. I'm not entirely sure this is the best version to buy, though, if this is going to be your first time at the Taiko rodeo, so to speak. 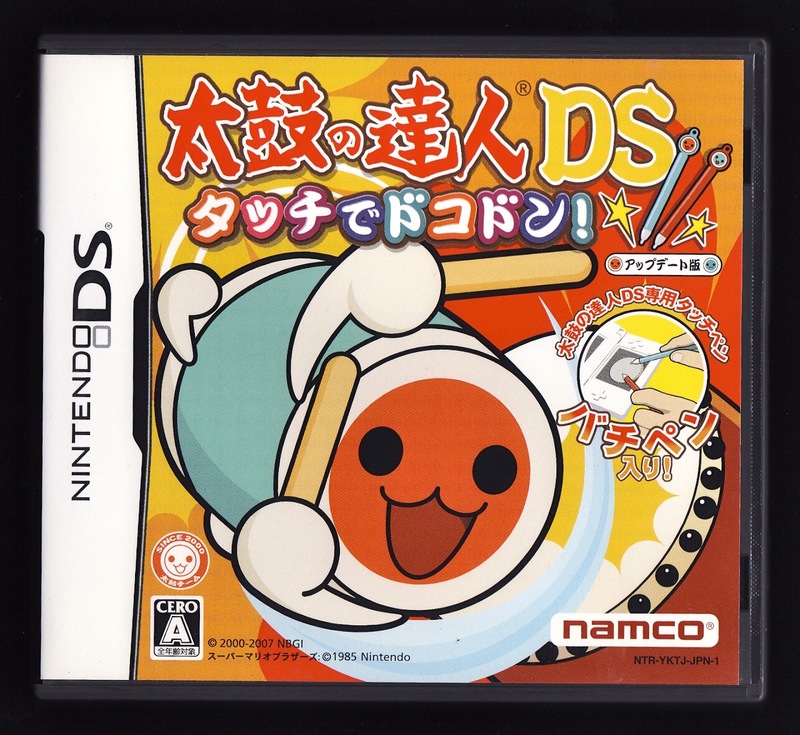 Both the second and third Taiko DS titles seem to be more robust experiences (offering more songs and modes), for example, and the PSP and Wii iterations are widely adored, too, so consider them if prices for this iteration are too high for your liking. I've seen that cute-as-hell drum around, but I never knew what it was from. Glad to have that cleared up. He (she?) is cute as hell, isn't he? You should try one of these games sometime, by the way. They're a lot of fun!